It’s that time of year when we start to think about what we want to change in our lives and what we’d like to achieve with the coming year. The New Year is a fresh start for all of us, yet many of us won’t include our home or garden within our New Year’s Resolutions. And we say that this is the wrong approach to your garden this New Year! Good fencing can really smarten up a garden, not to mention make it more secure against intruders. If you don’t check your garden fencing regularly for signs of wear and tear, now is the time to start doing so. Check for any storm damage, and look out for any rot or cracks in the fence panels or posts. Similarly, any fence posts which have started to lean need to be addressed. And if you find any signs of disrepair, make sure you instruct a professional fencing company to repair the damage as soon as possible. Having your patio professionally jet washed is something that every garden lover should be doing. Not only does it keep it clean and freshens up this area of your garden, but it can remove weeds, moss and algae which have grown in the cracks, therefore preventing any further damage to your patio. We’re all guilty of it: the weather gets colder and wetter, and the garden naturally becomes untidier. But this year, let’s resolve to clear up any debris and weather damage as soon as possible. Clearing up the likes of fallen leaves and branches, and generally keeping on top of garden maintenance means that our hard landscaping will be less susceptible to rot, or the likes of mildew growing upon it. If you’ve recently had a new garden fence professionally installed, it’s important to take the time to treat or stain it with a suitable wood stain or exterior paint. Many people install their fence and then forget about maintaining it with a treatment or stain. This often results in a grey, lacklustre looking fence which is susceptible to the elements. Treating your new fencing with a suitable paint or stain will not only keep it looking its best for longer, but it will also stop it from becoming rotten during wet weather. Wooden gates are an excellent line of defence against intruders. However, if they become loose or insecure, they won’t help the security of your property. This year, resolve to check the hinges and metalwork on your wooden gates, and where needed have any repairs carried out by a professional fencing company. Similarly, check the gate posts, and if they are leaning, cracked or rotten, have them replaced. 6. I Resolve to Enjoy my Garden! And really, this is the most important of all of the resolutions! If you need any help with any of your garden resolutions, then contact D&G Garden World. 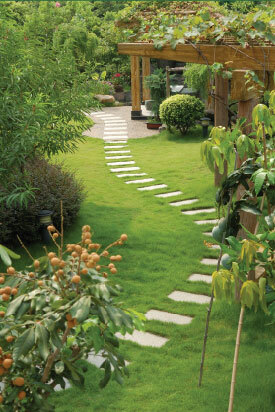 As experienced professional garden landscapers, we can help with all of your garden maintenance requirements. And if you keep on top of your garden and hard landscaping maintenance regularly, then the enjoyment resolution should easily follow!